2017 vintage was very late in Tapanappa’s Piccadilly Valley vineyards. The single outstanding feature of the 2017 vintage was that each of the phenological events of the vine’s growing season was delayed by 2 to 3 weeks compared to the average. The average temperature at Mount Lofty, adjacent to the Piccadilly Valley, is 17.6 ºC in February, 15.25ºC in March and 12.8ºC in April. Tiers Vineyard Was harvested on the 12th and 13th of March in the very warm 2016 vintage and on the 12th and 13th of April in the cooler 2017 vintage. The difference of one month in harvest date is a difference of 2.5ºC in the temperature during the critical ripening phase. That’s huge! My 2016 Vintage Report was headed “An Extraordinary Vintage” because the accumulated heat of the growing season in each of Tapanappa’s distinguished sites was so much greater than in any preceding vintage. Tiers recorded a whopping 1539ºC days against the average of 1240ºC days. I have labeled 2017 “A Contradictory Vintage” because the heat summation for the growing season was 1303º C days versus the 14-year average of 1240ºC days: 2017 was a warmer than average vintage but it is the equal latest, harvested on the same date as the very cool 2011 vintage (1001ºC days). It is obvious 2017 should be later than 2016 but why was it as late as the much cooler 2011 vintage? For the answer to that question we have to reach back to the winter of 2016, which was one of the wettest ever, leaving the soils cold and saturated. Add to that a very cool spring and the vines were very reluctant to get out of bed and welcome the new spring. Bud burst was delayed by 2 to 3 weeks and that delay was carried forward to a late flowering in early December. 100 days into the growing season in early January the pattern reversed and the temperatures became consistently above average until at the end the season is described as warmer than average. But the die had been cast in those first 100 days and the season was later than average by 2 to 3 weeks. This pattern of a cold start and a warm late finish is the perfect formula for outstanding fruit quality of intricate and intense flavours, moderate sugar levels and fine acids. 2017 was a very wet growing season at Mount Lofty. 562 mm’s of rain were recorded for the seven months against an average of 302mm’s. Fortunately most of that rainfall was before Christmas and after harvest in late April so had a more positive than detrimental effect. 2017 will be recognized as a superb vintage eliciting finesse and intensity in the Chardonnay from Tapanappa’s Piccadilly Valley vineyards. The ideal vintage conditions in 2017 allowed the Piccadilly Valley to show its best qualities. Tapanappa Piccadilly Valley Chardonnay was hand harvested into 0.5 tonne bins and delivered to the Tapanappa Winery. The Chardonnay fruit was destemmed, roller crushed, chilled to 2ºC and delivered into Willmes air bag presses. The free run and lightly pressed cold juice was pressed to a refrigerated tank. After a short gravity settling the partially clarified juice and its fluffy lees were racked to French Vosges oak barriques, 33% new and the balance 1 and 2 use. The Tapanappa Piccadilly Valley Chardonnay was seeded with our own yeast culture and allowed to ferment in the cool air temperature of the Piccadilly Valley autumn. 2017 Piccadilly Valley Chardonnay was allowed to sit on full fermentation lees until clear racking in January of 2018. 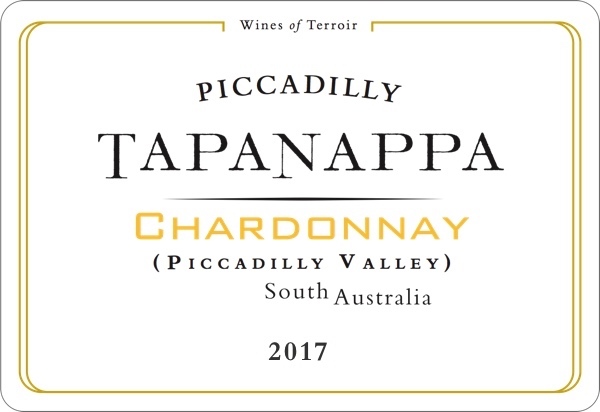 2017 Tapanappa Piccadilly Valley Chardonnay was bottled in early March 2018. 2017 Tiers Chardonnay is an exquisite expression of the unique Piccadilly Valley terroir from a great vintage. Pale green gold in colour, 2017 Tapanappa Piccadilly Valley Chardonnay has refined and fresh stone fruit aromas and flavours of white peach and pear. The subtle complexity of marzipan and vanilla oak complements the fresh fruit. The hallmark Piccadilly Valley Chardonnay texture is followed by a long after taste with a slight savoury quince finish. Bottled in March 2018. Only 450 dozen grown and made.